Fortunes can change quickly in the J. League, but the division’s misfiring big guns will have to start finding their range soon if they want to make a mark this season. With more than half of the first stage played, 2014 treble winners Gamba Osaka currently sit 10th in the 18-team table. Gamba’s true league position will remain unclear until they play their game in hand against Urawa Reds on June 15, but manager Kenta Hasegawa knows his side cannot wait forever to kick-start its spluttering challenge. 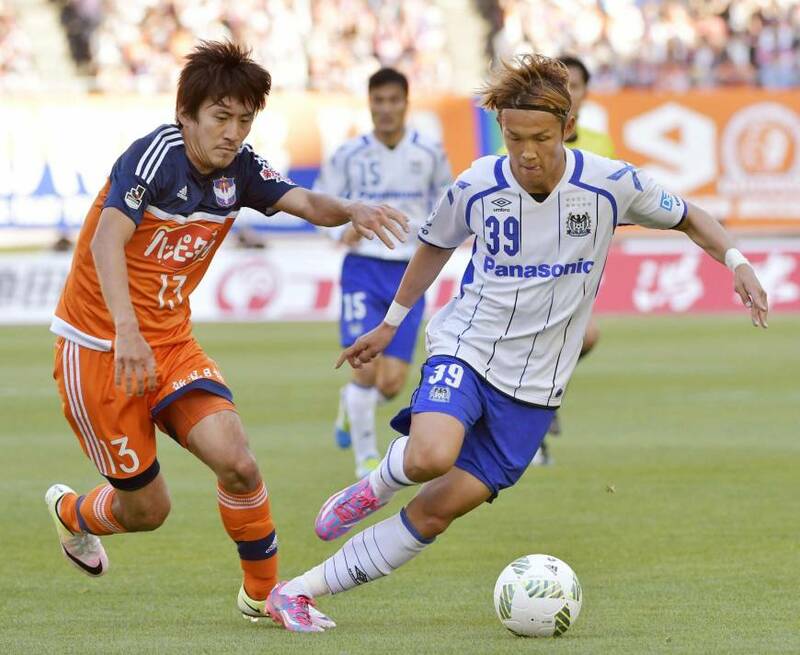 “We have a lot of quality players, but until someone can come up with the goods, it’s difficult,” Hasegawa said after Sunday’s 0-0 draw with Albirex Niigata, which left Gamba with only nine goals scored in 10 matches this season. Hasegawa will take comfort from the fact that his team entered the league’s 2014 World Cup shutdown in the relegation zone and still went on to win the title, but the manager would no doubt prefer to pick up points sooner rather than later. The same goes for FC Tokyo’s Hiroshi Jofuku, whose team currently sits 12th in the table, just five points off the relegation zone. Jofuku has been here before, having overseen Tokyo’s descent toward relegation in 2010 before being fired in his first stint in the job, and the 55-year-old knows that Sunday’s 1-0 win over Shonan Bellmare has only partially lifted the gloom. The rest of the league will not wait for Gamba and Tokyo to turn their seasons around, but Kashiwa Reysol have proved it is possible to go from zeroes to heroes in next to no time. Reysol looked doomed to a season of struggle when they found themselves winless after five games, but a subsequent run of five straight victories took the Chiba side all the way up to fourth place. A 3-1 loss to Kawasaki Frontale on Sunday ended Reysol’s winning run, but Gamba and Tokyo will certainly have watched their charge up the table with interest. Ironman: Yuji Nakazawa is showing no signs of slowing down. The Yokohama F. Marinos defender, who turned 38 in February, has now played every minute of Marinos’ last 100 league games after putting in a full shift against Ventforet Kofu on Sunday. 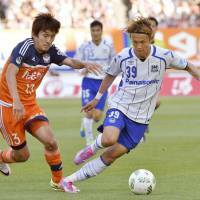 Nakazawa only needs to play three more games to move level with former Shimizu S-Pulse midfielder Teruyoshi Ito in second place in the J. League’s all-time appearance list on 517, but the former Japan defender was more concerned about letting points slip after a 2-2 draw with Ventforet. “We’re not able to attack or defend as a team,” said Nakazawa, whose team has not won in four matches and has yet to taste victory at Nissan Stadium this season. Looking up: It could be a long season for struggling Vegalta Sendai and Avispa Fukuoka, but Vegalta gave themselves a head start by beating their relegation rivals 2-0 on Sunday. Goals either side of halftime from Naoki Ishikawa and Hirofumi Watanabe gave Sendai an important win over Fukuoka, lifting their team out of the bottom three but keeping Avispa rooted to the bottom. “We’ve been waiting for this win,” said Ishikawa. “We’ve never wavered from our belief that we’re building a solid foundation under the manager, and we were sure that this time would come. Urawa Reds midfielder Yosuke Kashiwagi enjoys scoring in Sunday’s 1-0 win over local rivals Omiya Ardija.